Fishing in and around rocks takes the angler into one the shore’s richest feeding grounds for fish. Here there’s no shortage of tasty snacks lurking in the weeds for the small fish, and while they are busily feeding, the big fish are, in turn, contemplating feeding on them. Whether it’s a few isolated rocky outcrops in an otherwise sand beach, or a rugged stony shoreline rising to jagged cliffs, you can be sure that there’ll be fish eating, hiding from predators and keeping out of the worst of the tidal flow among the nooks and crannies. There’s no substitute for knowing your fishing grounds when it comes to sea fishing in general, and this is no exception. The key to success is to be able to read the rocks – to think like a fish and work out where the best hiding places and the best feeding opportunities are probably going to lie and what is the most likely route between them. A good reconnoitre at low tide should be considered essential preparation if you possibly can. Look for clumps of weed that will be harbouring small invertebrates and groups of shellfish, keep an eye out too for stretches of sand in the valleys formed between rocks which might hold burrowing worms or molluscs. Try to get a feel for the general shape of the environment and spot where the deep basins, shallow runs and clefts are going to be, once the water returns. A good notebook is a must to jog the memory, and it will build into an invaluable guide over the years – though never forget that even the rockiest of coastlines changes over time, and sometimes very abruptly. The better you know your “patch” and the more current your knowledge, the greater success you’re likely to have. The nature of the sea-bed and the time of year both inevitably influence the species to be found, but the range of fish which can be caught from rocks is surprisingly large. Depending on where you are and when you fish, bass, cod, conger eels, dabs, flounders, mackerel, plaice, pouting, sea bream and wrasse are some of the possible catches, along with skates, rays and some of the smaller members of the shark family, such as dog fish and tope. Fishing on a rising tide around dusk or dawn often produces the best results – but there’s really no bad time; arguably more than any other kind of sea angling, fishing the rocks can prove successful at any hour of the day, which goes a long way to account for its popularity. 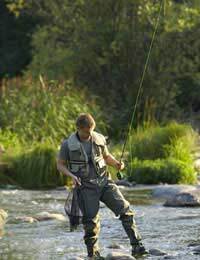 Conditions around the rocks make a few particular demands on tackle. Rods need to be strong, especially if you’re fishing from a bit of a height above the water and a length of between 9ft and 12ft will be ideal. There are no special needs in regards of your reel, so any good quality multiplier or fixed-spool, equipped with a sufficient amount of 12 to 20 lbs breaking-strain line will be fine, though if you’re fishing from a long way above the waves, 30lbs line would be better, to let you haul up your catch. Lower down, a long handled net and thinner line will suffice. Lifejacket – there are several kinds of snazzy flotation devices on sale that are purpose-made for anglers, so buy one and use it! Tide tables – an essential part of any sea anglers kit and the best way to make sure you don’t get cut off. Good footwear – rocks can be hideously slippery, so wear proper, strong shoes or boots. Never fish the rocks alone – one unexpected wave and no one to raise the alarm has seen the end of many an angler; don’t add to the number! Whether you’re fishing just a few feet above the waves, or from the top of a high cliff, between the crash of the water and the unpredictable nature of what’s likely to end up on your hook, rock fishing is an exciting experience. With a bit of careful planning and an eye to safety, it can be a very fruitful one too!